The Shore, located at Surfers Paradise, has outstanding views of the Pacific Ocean from all rooms. We’re located just across the street from the ocean, making it a very short walk to the beach! 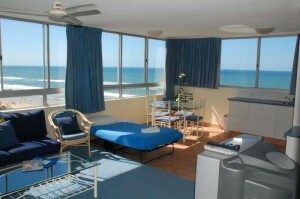 As you can see from this photo, our Surfers Paradise apartments are fully furnished. They come with a fully equipped kitchen, and a separate eating area. This gives you plenty of space to relax and enjoy that amazing view! We’ve got a pool downstairs, as well as a Cafe & Bar to help you unwind.